Cosmic Composition is easily understood. The sun shines in the middle. Above it, the crescent moon and stars of various sizes are scratched into the coloured ground, while houses, steps and trees - also reduced to linear signs - cluster around it. The effect of space is produced directly by the colours and owes little to three-dimensional perspective. One discerns an eye at the back of this glowing cosmic realm: standing behind things and above Creation, it symbolizes the force governing the cosmos. 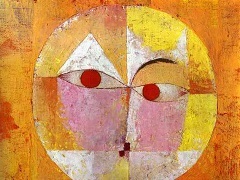 This same eye occurs in other paintings by Klee from this period. 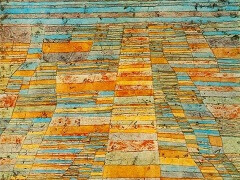 The picture also shows how Klee has now succeeded in imparting life, fluidity and transparency to oil colours as well. 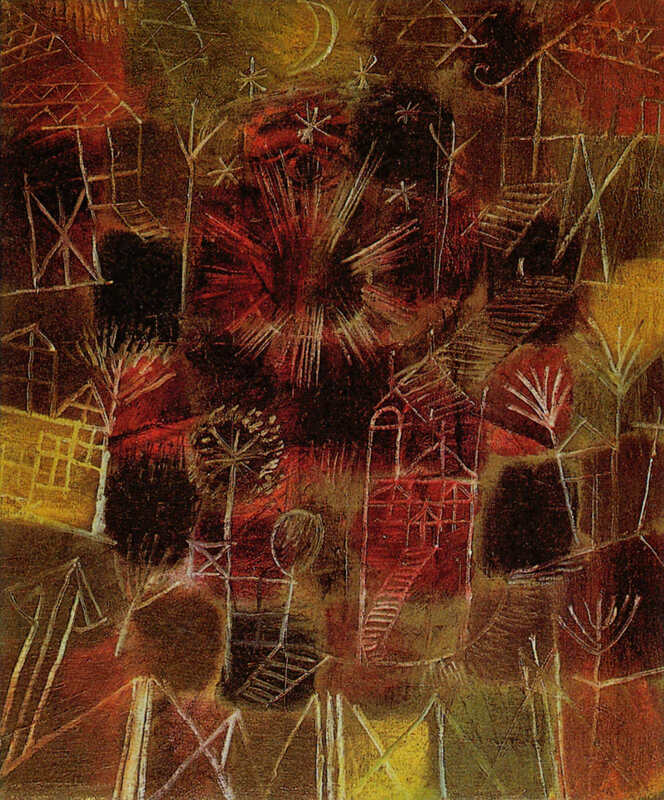 On returning from the war Klee painted a series of pictures with 'cosmic' subjects. He developed a vaguely religious natural philosophy, according to which all earthly things are the emanation and expression of an encompassing being. He was not alone in his generation in this way of thinking. 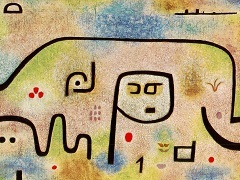 Such thoughts were formulated and given shape by his 'Blue Rider' friends, Wassily Kandinsky and Franz Marc. 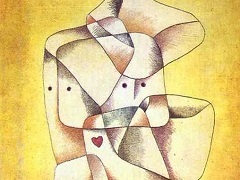 Klee stated: "Art is an analogy of Crea­tion. 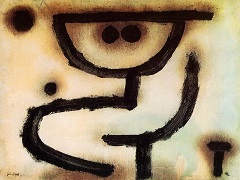 It is but one example, just as the terrestrial is an example of the cosmos." One is very close to a picture like Cosmic Composition when one reads: "I take hold of a remote point at the origin of Creation, where I anticipate formulae for humans, animals, plants, rocks, earth, fire, water, air and all circling forces at once." 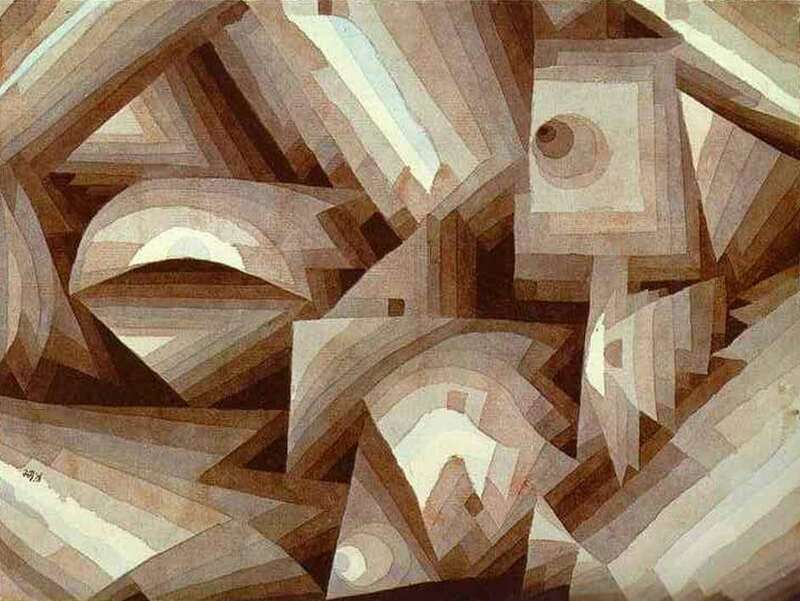 This sentence comes from Klee's Creative Credo of 1919, in which he formulated his artistic beliefs. The idea of a cosmic law governing all earthly things refers back to the 'Universal One' of German Romanticism. 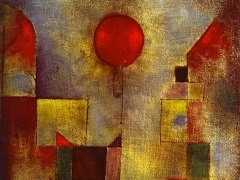 Klee saw himself continuing this tradition, as represented by the painters Caspar David Friedrich and Philipp Otto Runge, the poet Novalis and the poet-philospher Carl Gustav Carus. Soon he was to relinquish the Romanticism of his early years, but he never abandoned some of its tenets. 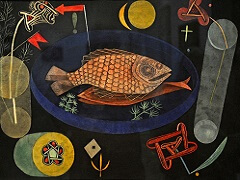 The same Romanticism lay at the root of the work of some other 'Blue Rider' artists, especially that of Marc and Kandinsky.